If this is your first time logging into our new Stack Sports website, you must create a new account. See the note about family accounts below. Mandatory On-Line Background Check: All volunteers 18 years of age or older must complete a mandatory on-line background check. Even if you have already completed in the last 3 years, CJSA has transitioned to a new background check reviewer which is a bit more in depth. To complete the background check, please register as a coach on our new website (link below), but note the following requirements. LEGAL NAME. Please enter your full, complete, and LEGAL name. No nicknames or abbreviations. This will ensure a smooth review without delays. DOB: CJSA (Connecticut Junior Soccer Association) and GHSC (Glastonbury Hartwell Soccer Club) require that all adult volunteers provide their date of birth as part of the volunteer registration. Social Security Number. The new background check process requires that the user enter in their social security number when creating your member account. Your social security number is NOT stored in Stack Sports' database or in Glastonbury Hartwell's database. The number is immediately encrypted and sent to the background check provider. PLEASE NOTE THAT NO ONE WILL BE ALLOWED TO HAVE A VOLUNTEER POSITION UNTIL ALL MANDATORY REQUIREMENTS ARE MET. 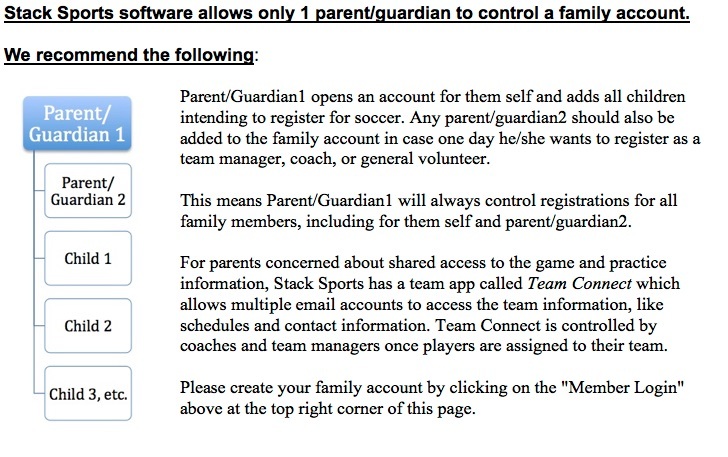 Whether you're new to Glastonbury Hartwell Soccer or have been registering your family members in our programs for years, you must create a new Glastonbury Hartwell/Stack Sports account to register for GHSC programs. Please log on now and create your family account by clicking on "MEMBER LOGIN" above in the top right corner.